Several herbs may be helpful in treating symptoms associated with your spinal stenosis. According to the National Institute of Arthritis and Musculoskeletal and Skin Diseases, spinal stenosis is a condition in which narrowing occurs in one or more of your spinal passageways. Spinal stenosis can compress your spinal cord or spinal nerve roots and cause significant back pain. Before taking herbs to help treat symptoms associated with your spinal stenosis, talk with your doctor about possible side effects, appropriate dosage and potential drug interactions. Devil's claw, also known as Harpagophytum procumbens, is an herb that may be helpful in treating your spinal stenosis. According to the Memorial Sloan-Kettering Cancer Center, devil's claw, a member of the pedaliaceae family, has been used to help treat many health complaints, including muscle pain, general pain throughout your body and degenerative joint disease. Devil's claw possesses a bitter taste. The root or tuber of the plant is used medicinally. Dr. Sharol Tilgner, a naturopathic doctor and author of the book "Herbal Medicine From the Heart of the Earth," states that devil's claw is an anti-inflammatory, anti-arthritic and analgesic, or a substance that relieves pain. Devil's claw, notes Tilgner, has been used to help treat numerous musculoskeletal problems, including nerve pain and lower back aches and pains. White willow is an herbal remedy that may be beneficial in treating spinal stenosis-related symptoms. The University of Maryland Medical Center states that white willow, also known as willow bark or Salix alba, is native to Europe, Asia and certain parts of North America. White willow, a member of the salicaceae family, has a bitter, astringent taste and cooling and drying tendencies. The bark of the tree is used for medicinal purposes, including pain relief for musculoskeletal problems such as spinal stenosis. According to Dr. William A. Mitchell Jr., a naturopathic physician and author of the book "Plant Medicine in Practice," white willow is an anti-inflammatory and analgesic that contains salicylates and acts like aspirin to reduce musculoskeletal pain. Turmeric, also known as Curcuma longa, is an herb that may be effective in treating your spinal stenosis. 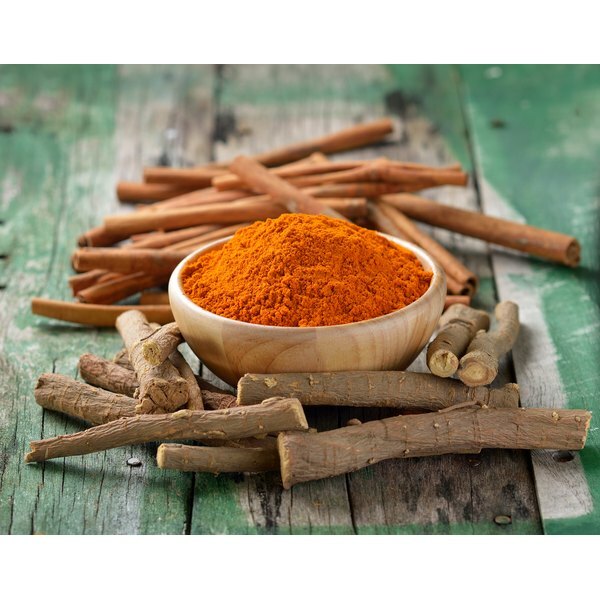 According to the National Center for Complementary and Alternative Medicine, turmeric, a member of the ginger family, is a perennial shrub that grows in certain parts of Asia and Africa. Turmeric has a bitter and pungent taste and possesses cooling and stimulating tendencies. The rhizome, or underground stem, of the shrub has been used to help reduce inflammation associated with musculoskeletal conditions, such as spinal stenosis. Dr. Michael T. Murray, a naturopathic physician and author of the book "The Healing Power of Herbs," states that turmeric is a potent anti-inflammatory when taken orally. Tilgner cautions that this herb should not be used during pregnancy, due to its ability to stimulate your uterine. What Are the Benefits of Marshmallow Root & the Slippery Elm Herb?